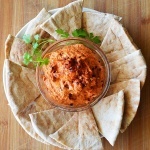 When I was researching recipes for something I could use leftover pomegranate juice in, I came across Muhammara. Muhammara is described as a Syrian Roasted Red Pepper Walnut Dip and it’s made with red peppers, walnuts and … pomegranate molasses. According to The Food Lover’s Companion, the pronunciation is: [moo-hahm-MRAH] with the emphasis on the last syllable. 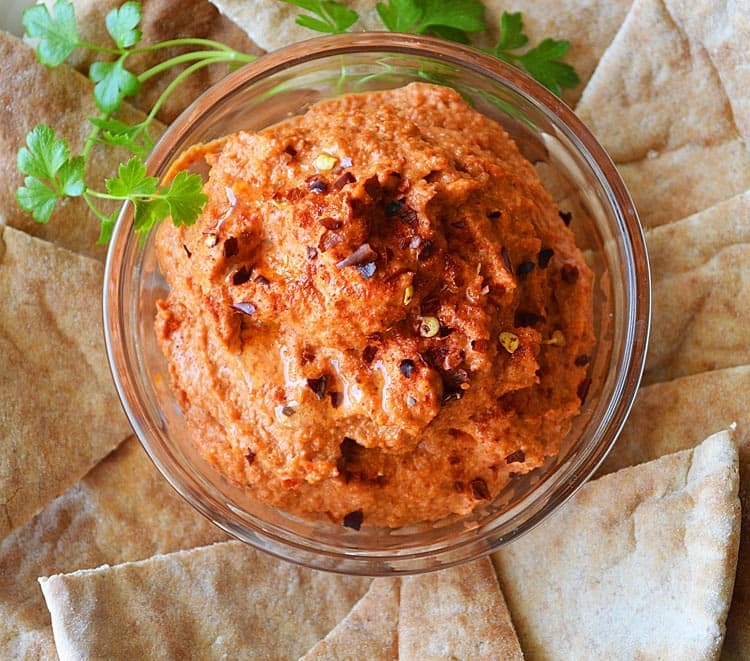 It’s a nice addition to, or substitution for traditional hummus. Now, if you can’t find bottled pomegranate molasses – don’t despair. I have yet to find bottled pomegranate molasses in my local grocery stores either and that’s why I’m going to show you how easy it is to make it yourself! In fact, if you have ever made my Quinoa Veggie Burger with Pomegranate Molasses, you’re already ahead of the game with this recipe. This recipe makes about a Cup, but doubles easily. Prepare the red pepper by removing the stem and seeds. Slice into 4 pieces. Prepare the garlic by slicing off the top to expose the cloves. Place in foil and drizzle with olive oil, salt and pepper. Wrap tightly. (To remove the caramelized cloves, just squeeze the head of garlic and they will come out easily). In a 375 degree oven, roast the red pepper and garlic clove. Alow to cool. Meanwhile, in a saute pan, toast the walnuts. Keep an eye on these, it goes quickly. To make your own pomegranate molasses, combine pomegranate juice, sugar and lemon juice in a sauce pan and reduce until it is half it's volume. It will make more than you need for this particular recipe but it makes an amazing salad dressing. In the bowl of a food processor, add the walnuts, bread crumbs, pepper and garlic. Process until smooth. Add all remaining ingredients except oil. While the processor is running, drizzle in 2 Tbl of oil and process until everything is combined. Serve with pita wedges. You can toast these in the oven if you'd like, Brush with a bit of oil and sprinkle with salt. Bake just until crisp. Drizzle a bit of olive oil just before serving and top with a dusting of paprika and red pepper flakes. Garnish with a sprig of parsley.